Man & machine - Retro resto mod rod Even the patina is patinated on James Mitchell’s Jaguar XK120. Words Paul Hardiman. Photography Jonny Shears. Since starting Pendine at Bicester Heritage five years ago, James Mitchell has handled the sales of some mighty motors, including lately the Hairy Canary Cobra racer. Pendine has also been chosen to disperse the Swiss-owned Jaguar Sports Car Collection, including the ‘lost’ C-type #XKC023. But this magnificently timeworn XK120 is his own, and it knocks them all for six for character. The paint – ‘nobody knows when it was put on, but it’s been about seven different colours’ – is starred and cracked, the race numbers almost polished through. The seat leather is patinated to the point of distress, and the rest of the interior is minimalist – there isn’t any. The steering wheel’s wood rim (it’s from an HWM) is missing a couple of chunks, as if it’s been nibbled by something naughty. The whole plot is menacingly magnificent, from the jutting headlights and big-bore side exhaust to the way it sits low over Dunlop Racers. It’s a real right-hand-drive home-market car, built on 9 November 1950 in silver with Duo- Blue interior, and registered, via Standard-Triumph and Jaguar dealer Rothwell & Millbourne of Malvern, on 20 November. The husband of a subsequent owner liked to sprint it, but no pictures have come to light so far – if you have any, please get in touch. By the 1970s, probably in this colour, it had been put away. 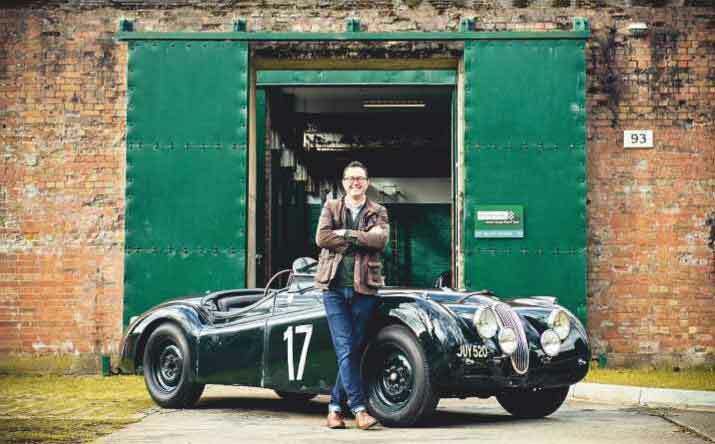 Looking straight out of Dr James Fraser’s book The Jaguar XK120 in Competition, it was rebuilt from the chassis up as the epitome of the early XK club racer. Behind the front pair of vented wheels are Jaguar MkIX disc brakes. The suspension has adjustable dampers plus radius arms at the rear. The motor is a 3.8 that Broad was building, with a C-type head, E-type cams and HD8 SUs. The whole engine is set back and lower in the chassis, driving via Broad’s five-speed gearbox to an LSD. Power is around 250bhp; a standard 3.4 C-type gave 210. Hence the worn-shiny perforated driver support to the left of the seat, like something from a wartime bomber but actually new, made by Olliminium at Bicester: ‘I couldn’t afford to have Guy Broad bucket seats covered in old leather, but I was sliding about on the seat,’ James explains. It’s perfectly in character with the purposeful, raw appeal of the rest of the car.